I received this free pattern from the daily emails I get from www.allfreeknitting.com and immediately thought of them as a great hand-made alternative to the usual store-bought cosies for Christmas. It is a very simple pattern to make and it wasn’t time-consuming at all. I managed to make 7 in about 3 – 4 days. Unfortunately, the aran wool we find here in Malta, is usually 400g balls of a few speckled colours which aren’t exactly festive ones. But the lady at the wool shop showed me these few remaining balls of fluffy, sparkly wool which were on sale and told me they should be fine with their texture. We bought 6 balls (3 of each colour) and they did indeed do their job well as you can see from the picture. 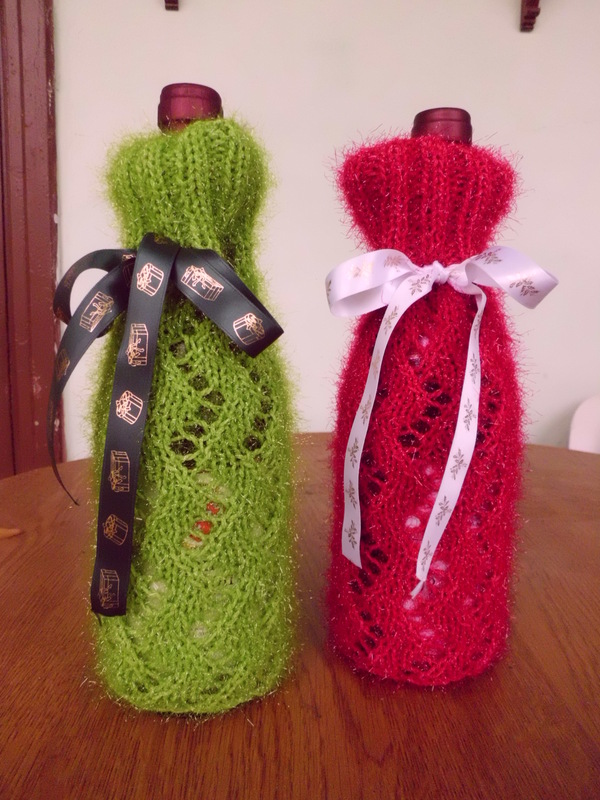 Wine cosies to add a little Christmas flair to your wine bottle gifts. One word of caution though! – If you decide to make these cosies for your wine bottle gifts, be careful when you pick the bottles up – make sure you hold them from the bottom as well or else have a good grip on them because this pattern has no bottom and it’s very easy for the bottle to slip out! Previous I’m back (sort of) with a new project!